2017 bulletin board / office sneak peek! Almost as long as The Dainty Squid has had a home online I’ve been sharing photos of what my bulletin board looks like at the beginning of each year. This is my sixth year of bulletin boards! Links to past years at the bottom of the post. I try to change things up at the end of each year. I like to take everything down, and start over. I enjoy the fresh start, and any excuse to redecorate is fine by me. This year I actually moved on the first, and just before that I finally thrown out that old bulletin board I had been using for all these years. 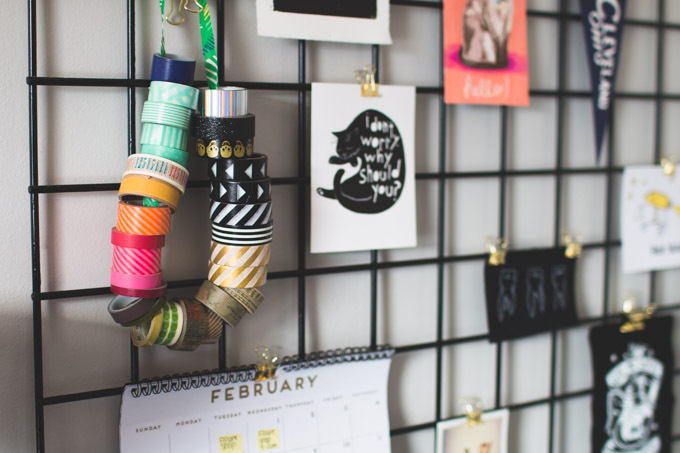 I had a very specific look in mind for my new office and it certainly didn’t include a nearly ten year old cork board that was so well used it was missing chunks. 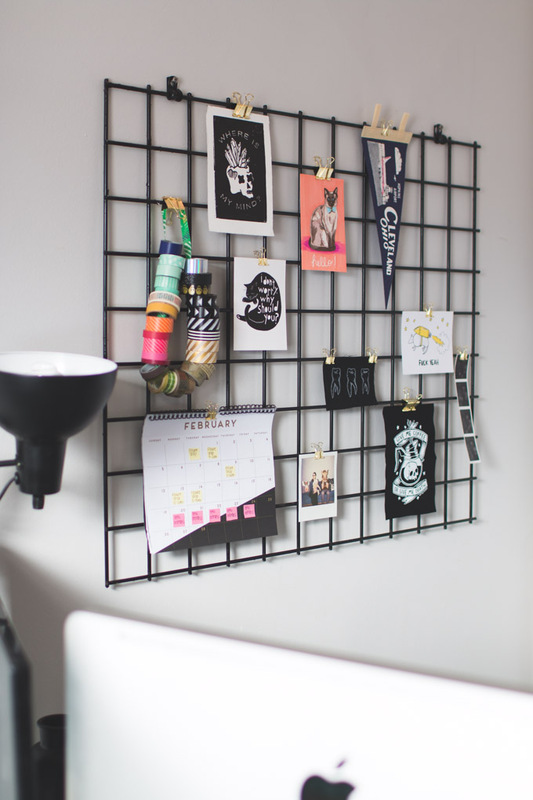 A while back I spotted this wire grid wall over on Urban Outfitters’ website. It was love at first sight. I knew immediately that was exactly what I wanted in my office. The only issue was the price. It’s 100% not worth that much money…like ever. 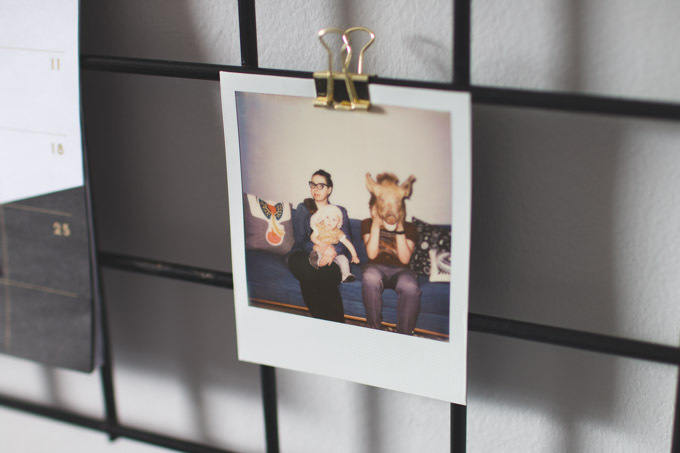 No matter how cutesy it is or how well they photograph it – it’s just wire. I tried buying gridwall online but was always confronted with the issue of super high shipping costs or having to buy in bulk. I hunted all over for something similar at stores like Lowes, and Home Depot. I figured they’d have some fencing that would work but I just kept coming up empty handed. I eventually found this one which is gorgeous, gold, and has accessories you can buy but it was a bit smaller than I wanted. I had pictured my new memo board as the focal point of the room. As a last resort I called my dad to ask if he had anything I could use. He was a bit confused by what in the world I wanted it for but suggested an old dog crate he had in the garage. I wasn’t completely sold on the idea of using a dog crate but figured it was worth a shot since I wasn’t having luck anywhere else and was more than ready to get started on my office. I had my dad trim it into rectangle for me then I dragged it home. Two coats of spray paint later aaaand it’s exactly what I had pictured all along. So, I ended up spending a grand total of six dollars and nineteen cents on this project and that was just for the pretty gold clips I’m using to hang things with. It was annoying process trying to find the supplies to do this project without spending a fortune. There were even a few moments where I was like “Screw it, I’m buying the one from Urban! I don’t even care anymore!” But I couldn’t be happier with how it turned out, especially after hanging some stuff on it. I say this every single time I share photos of the office I’m currently in at the time but this is my favorite one so far! My style feels a lot more developed than it was even last year. Despite the fact I still have a few projects I want to work on, such as painting that Ikea cart (you know the one, the one that everyone owns!) and hanging things on the wall, this office is looking gooood! For now I just have a bunch of photos of my snazzy dog crate heh! and a few peeks at other corners but you can definitely expect to see a full room tour as soon as I finish up. Rug is from TJ Maxx. Calendar is from Target’s dollar section. Shark trash can was thrifted. Portrait of Professor by Emily Ledbetter. Take a peek at past year’s bulletin boards here – 2012, 2013, 2014, 2015 + 2016. I love all of this so much. 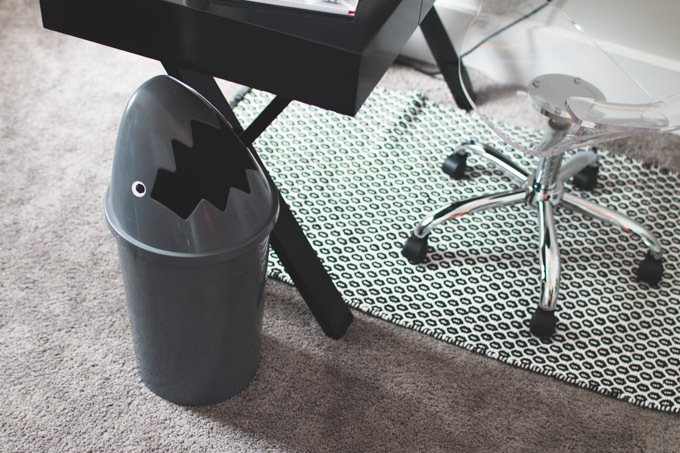 That shark trash can – WHAT a find! Boy do I miss Ohio thrifting. What a dream workspace! Way to re-purpose! 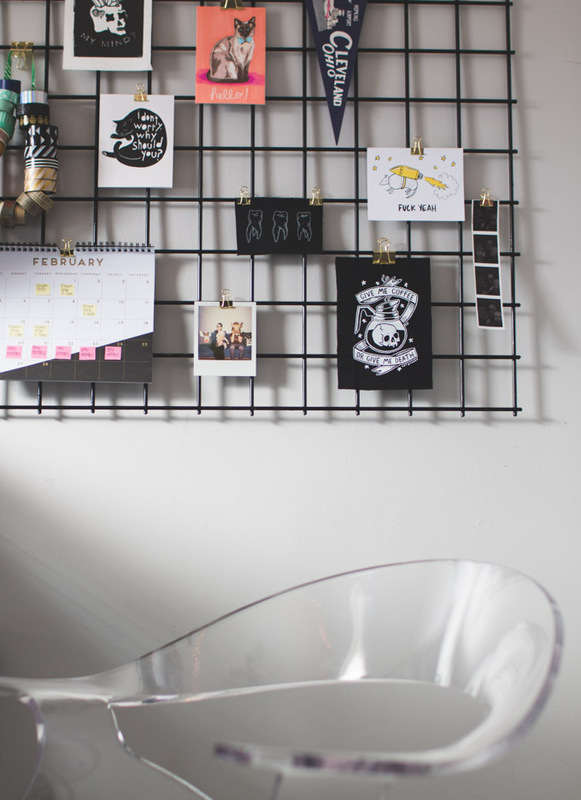 It looks really good with the rest of your decor… kind of brings to mind your penchant for black and white dresses! 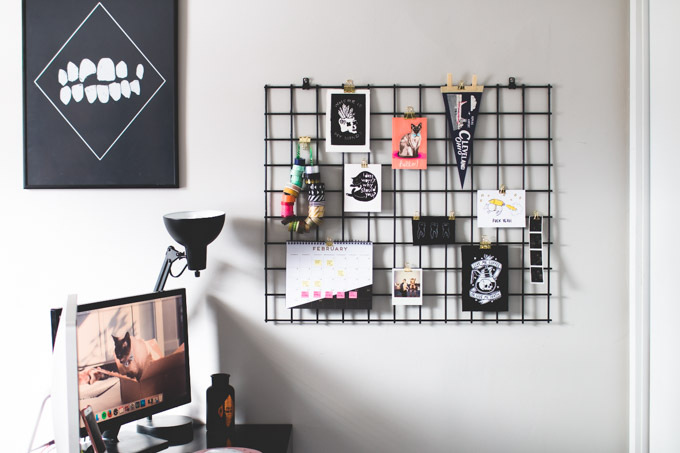 Ive been oggling that exact same grid at UO and have been trying to come up with a DIY for the exact same reason. Yours looks fantastic!!! I actually really like that bulletin board! I made a similar one years back with chicken wire after I saw a friend do it for her wedding. Yours looks very sleek and modern. 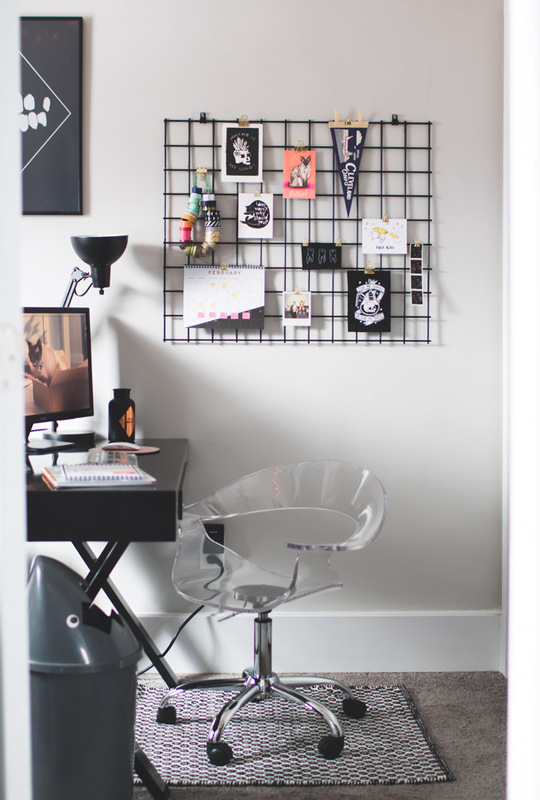 That grid wall is gorgeous & I LOVE that you DIYed it with an old dog crate, of all things. Perfect! 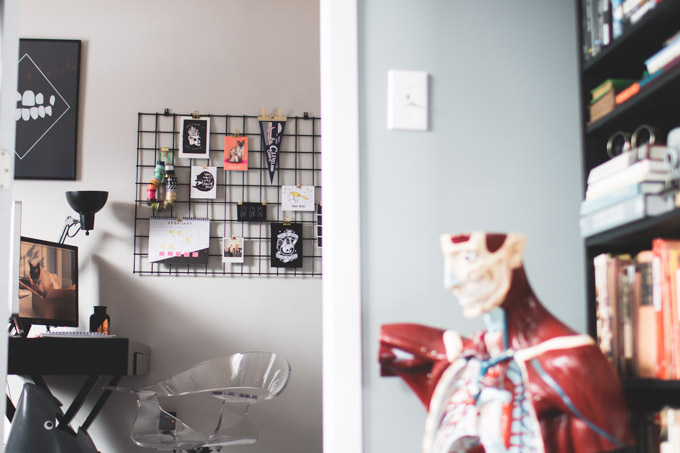 Our apartment isn't really big enough for me to have an office, which is SO stressful for me. I work from our kitchen table, which means every night, I put everything away, & every morning, I bring it all back out. I'm desperate for a real office again! I AM SO BUMMED I CAN'T BUY YOUR SHARK TRASH CAN!!!!! I scrolled to the bottom of this post like blah blah blah WHERE'S THE TRASH CAN-nooooooo!!! Anyway. Sigh. 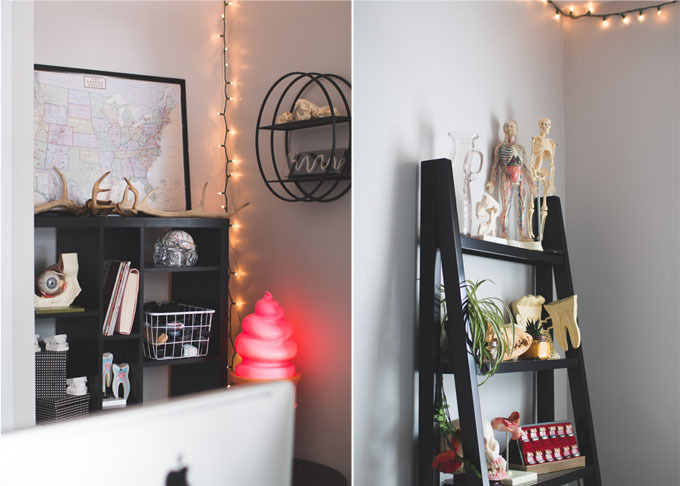 Your office is looking super cute! Hahah! I'm so sorry Kristina! I've searched high and low time and time again to find any information on it anywhere on the internet but always come up empty handed. This looks really great! I definitely know what I'm doing with the extra door piece that came with my dog's crate that's just been sitting in my closet for the last year! This is my favorite version of your office yet! 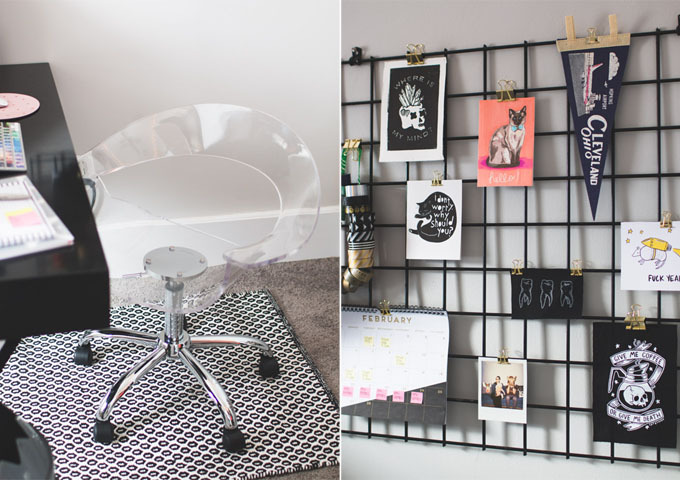 I've been crushing on that grid board since you posted it way-back-when… a dog crate! What a genius idea! My parents have one of those laying around for sure! 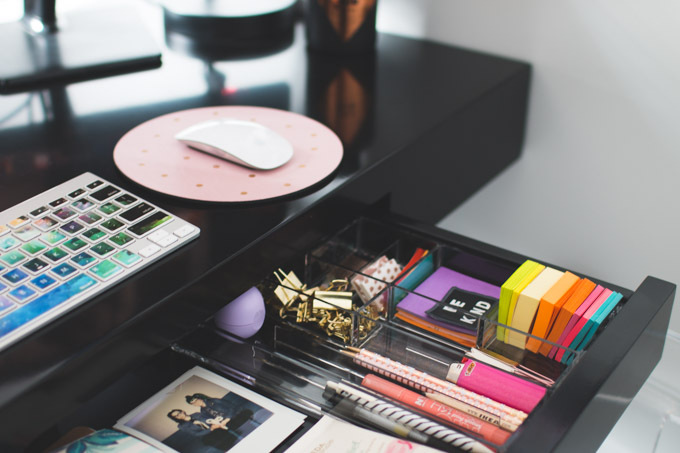 Also, your desk makes me miss having a desk with a drawer… mine is so cluttered right now and it makes me not appreciate my space as much. But I have nowhere to put the mess yet still keep it convenient! And I love that chair. 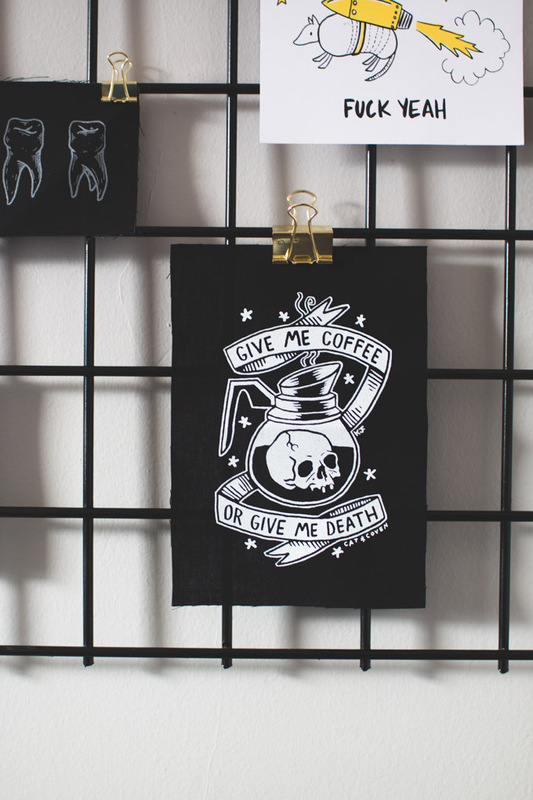 I saw some similar ones on a recent Home Goods trip and I was so freaking close to bringing one home for myself. I'm so over my leather office chair. SO OVER IT. Time for a revamp. You've motivated me! I can't find the tooth print anywhere on Explorer's press. You do mean the big one on the wall correct? 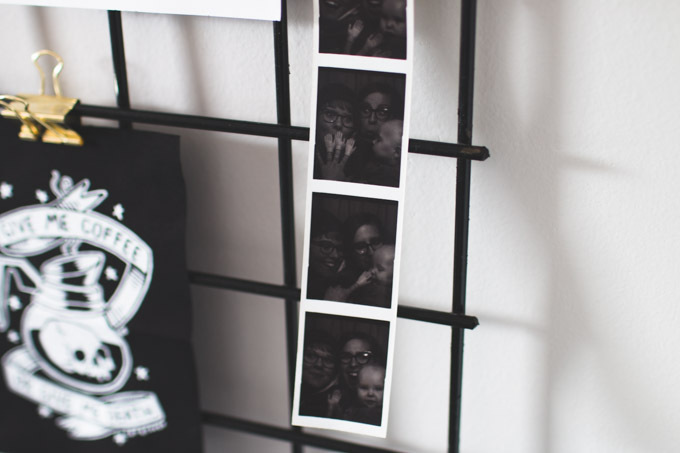 Because I've been adoring that for ages, seeing it in all your apartment updates and such.